What if I told you there was a woman who knew magic? A woman with a restless sea rising inside her, an inner flame so scintillating her bones glow with it, a woman whose words cannot be contained by a book, but ripple through it, up your hand and into your heart, until it trembles and sings with all the turmoil and joy of a newborn sun? That woman exists. Her name is Rachel McCrum, and her magic of choice is poetry. 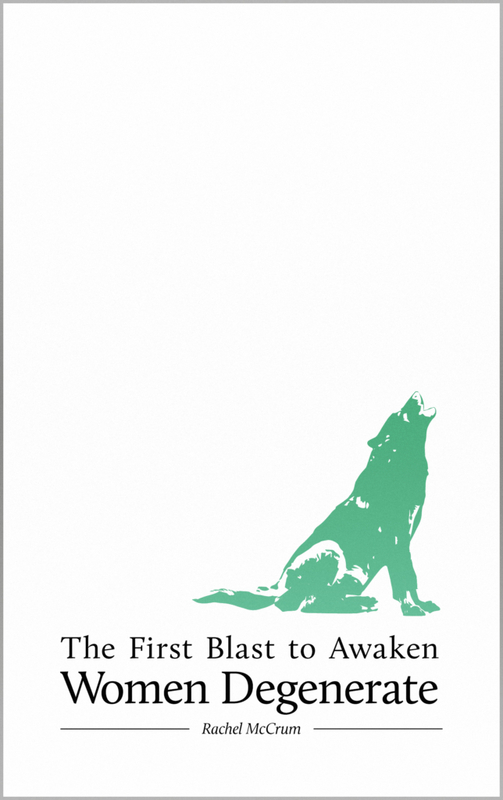 The First Blast to Awaken Women Degenerate is a captivating book. Arrestingly brought to life by the vibrant Scottish publisher Stewed Rhubarb Press, the book tells remarkable tales of love and rage, displacement and homecoming. Rachel is an endlessly empathetic writer, blessed with the ability to roam into the most unreachable chambers of our dreams and tell us the wonders and horrors she saw there upon her return. It is as rewarding as it is emotionally difficult to read her immaculate poetry. It requires the kind of introspective work many of us feel unprepared for in a world where the denial of own feelings, not to mention those of others, is so commonplace. splendid glistening fat, sodden and roasted. Rachel holds up a mirror to our secret dreams, our hidden rage. And it’s difficult to carry on as normal once you’ve witnessed the wonders within. She draws us into the deepest mists of ourselves, her words spread like stars above us, constellations of them, showing the way. Some poems incubate in your heart, hatching like hope when you least expect it, and others hit you with a flourish and a flash, demanding more of you, promising the world in return. This is poetry at its best. Poetry which makes you want to be a better person. hook, line and sinker will pull you up. Sweat till the devil loses your scent. the full name of your nemesis. Madonna, we love you! Get up! In her poem, “Who Wants a Home?”, a merciless authoritarian voice barks a list of commands at a fragile and displaced group of people, who are pleading with it in vain for a place to live. The voice commands against a backdrop of the whitest silence. Rachel’s use of space in her poems is always dynamic, and in this poem it serves to add to the sense of isolation felt by those who are pleading with the ones in power. As memories of lives once lived diminish into the distance, to be replaced with a dazzling lack of all things substantial, we feel the urge to cling to the beginnings of things – to times before our plans began to fall apart. “We thought we’d grow up in houses like this. We thought we’d grow up. The pain in admitting the chance to live a dream has passed is one we all hope to avoid. The voices in Rachel’s poem can do this no longer. “Is this really our fault?” they ask. “Our squints, our greying hairs / our failing energy, our fear?” The answers are beyond us. So are the solutions. While thousands of people go through this humiliation on a daily basis, their voices would sink into anonymity without words like Rachel’s. Words which make lost people real to us again. For Rachel, summoning up the voices of women is no vanishing passion. They echo through the pages of her books, march in their hundreds behind her as she speaks. They are women she has conjured. Women she has been. Women she has changed. I am glad to be one of them.